Fairtrade guarantees poor farmers in developing countries a fair and stable price for their products that enables them to support their families and invest in a better future. It is becoming a vital part of the battle against world poverty. Supporting Fairtrade is something most people can do as part of their daily lives. Support for Fairtrade is growing both here in Sussex and nationwide. 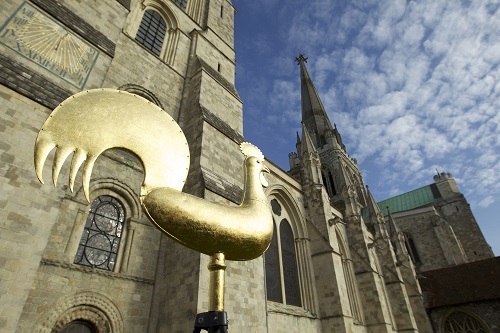 Chichester is a Fairtrade City and became the first city in the UK to use Fairtrade gold on a public building when the cockerel on top of the Cathedral spire was coated with Fairtrade goldleaf in November 2011. Whether you are eating out or eating at home, there are plenty of places where you can buy Fairtrade. Make a choice to ‘Change today and choose Fairtrade’. Sainsbury’s – all’ Taste the Difference’ tea bags and loose tea (Red andGold labels are no longer under the Fairtrade logo); café Direct tea bags; own brand ground coffee incl. decaffeinated and coffee beans; Café Direct ground coffee (5 varieties); Percol ground coffee; Starbucks Expresso ground coffee; Café Direct & Clipper instant coffee; Green & Black cocoa & drinking chocolate; own brand sugars; Tate & Lyle brown & golden sugars; Green & Black chocolate bars & chocolate selection boxes; all bananas. Waitrose – variety of own brand tea bags & loose tea; Clipper tea bags & loose tea; & Duchy Organic breakfast tea bags; own brand, Café Direct & Percol ground coffee (wide choice); own brand coffee beans & filter pods; own brand, Café Direct & Percol instant coffee; own brand, Clipper, Café Direct & Green & Black’s drinking chocolate; own brand, Divine, Green & Black’s chocolate bars (variety of sizes & flavours); own brand & Divine chocolate selection boxes; Tate & Lyle sugar (wide choice incl. icing, preserving & cubes); own brand brown sugars; Bart’s spices; all bananas; Green & Black’s cooking chocolate; Kallo rice cakes; limited choice of Argentinian red & white wine. Marks & Spencer (East Street) – all own brand ground & instant coffee, coffee beans, tea bags, loose tea & drinking chocolate (wide choice); most sugar except granulated; own brand jams & marmalades; own brand chocolate bars; own brand Italian Chocolate selection boxes; wrapped but not loose bananas. Tesco Extra – own brand ground coffee; Percol decaffeinated instant coffee; own brand Gold Blend tea bags & loose tea; Clipper ‘Everyday’ & Earl Grey tea bags; Green & Black chocolate bars; Tate & Lyle sugars (but not granulated). Aldi – organic bananas; Diplomat tea bags; own brand Specialist Selection ground coffee & Columbian instant coffee; Moser Roth chocolate; Tate & Lyle dark soft brown sugar; roses. Oxfam Shop – Café Direct ground & instant coffee incl. decaffeinated; Grumpy Mule ground coffee; Café Direct instant coffee incl 500g tin; Café Direct tea bags incl 440 size; Divine cocoa & hot chocolate; Divine chocolate bars, variety of sizes & flavours; Divine After Dinner mints; biscuit, various flavours; sweet, various; Zaytoun Palestinian olive oil; honey, set & runny; raw cane sugar; dried tropical fruits. Southern Co-op (Spitalfields Lane; Sherbourne Road, Parklands; Bognor Road; Lavant Road) – own brand tea bags, loose tea, ground coffee, instant coffee. Coffee pods, cocoa & hot chocolate; Café Direct ground coffee; own brand & Divine chocolate bars; a variety of chocolate selection boxes & novelties; all sugar; all bananas; Chilean, Argentinian & South African red, white & rose wines; red, white & rose wine boxes. Manuka Wholefoods – Clipper, Café Direct & Percol ground coffee incl decaffeinated; Grumpy Mule coffee beans; Clipper tea bags incl decaffeinated; Clipper & Green & Black drinking chocolate; Divine chocolate bars, various flavours; Equal Exchange honey. Cred Jewellers – a pioneer in marketing Fairtrade gold & silver jewelry. Greggs – all coffee, tea, hot chocolate & sugar. Crispin’s, East Street – coffee & speciality teas. Charlie Harper’s, East Street – hot chocolate & speciality teas. Montezuma – chocolate; Lush – personal care products; Eat, North Street – Rain Forest Alliance certified tea & coffee.